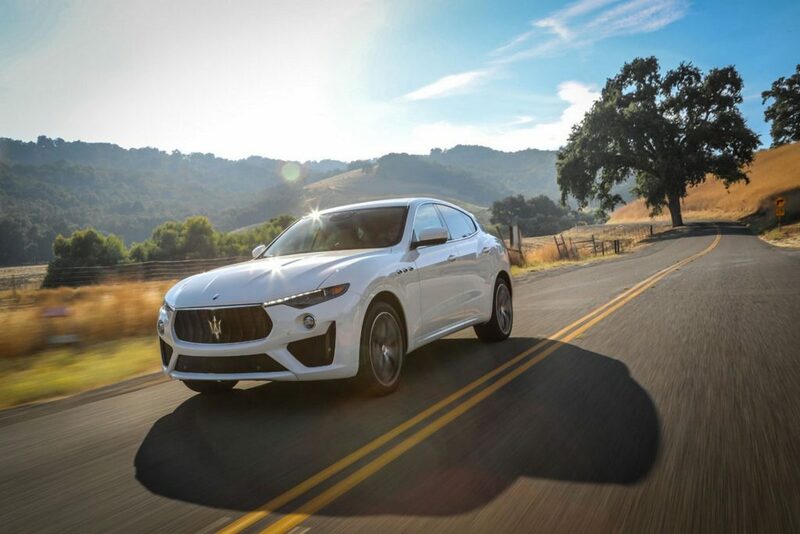 At the 2018 Los Angeles Auto Show, Maserati showcases the Levante SUV in the GTS and top-of-the range Trofeo trims, both equipped with the powerful “Made in Maranello” V8 engine able to deliver 550 hp for the GT and 590 hp for the Trofeo. The entire MY19 range will also be present on the Maserati stand, with Ghibli, Quattroporte and Levante in the GranLusso and GranSport trims, the ideal embodiment of the Brand’s dual personality. Also on display will be the GranCabrio MC, a fine incarnation of the Maserati open-top GT concept. A range which has never been so rich and complete, and is certain to stun the West Coast motoring enthusiasts visiting the Los Angeles Convention Center from 30 November to 9 December. The Maserati stand in the “City of Angels” will also host two of the Modena Brand’s historic partners, Ermenegildo Zegna and Bulgari, each with its own exclusive area. 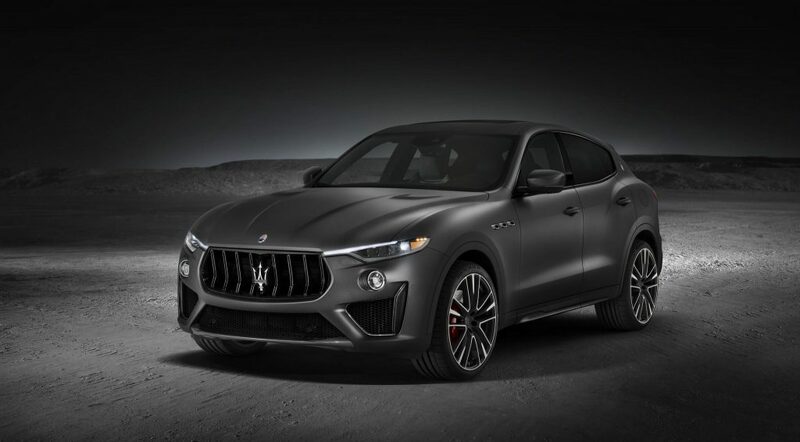 The Levante Trofeo, present on the stand in Grigio Opaco colour with sport seats, black “Pieno Fiore” leather interior with red stitching and 22-inch Orione wheels, is the ultimate “Maserati of SUVs”, capable of accelerating in style from 0-100 km/h in just 3.9 seconds and reaching a top speed of 304 km/h. Maserati engineers developed the mighty 3.8-litre Twin Turbo V8 engine to accommodate the Q4 Intelligent All-Wheel Drive system providing it with a new crankcase design, specific crankshaft assembly, new oil pump and auxiliary belt and a different wiring layout. 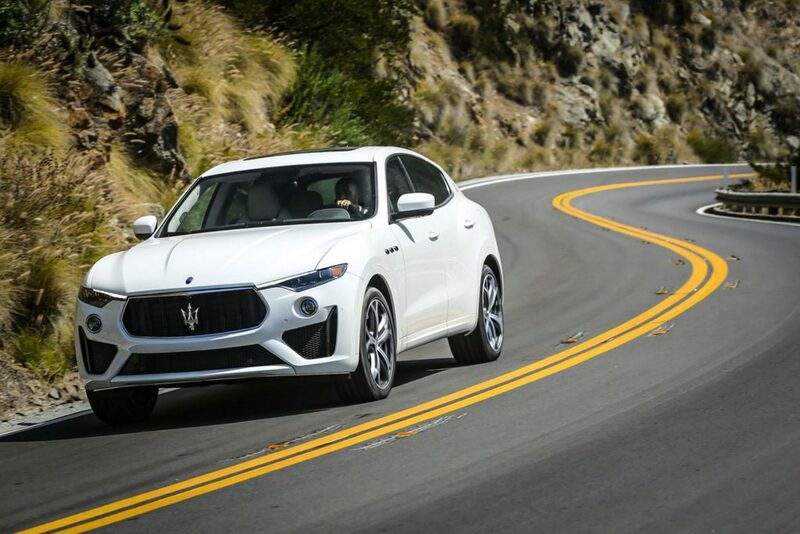 Thanks to new turbochargers with increased flow, a redesigned cylinder head with specific camshafts and valves, new pistons and new connecting rods, the Levante Trofeo is able to achieve impressive power peaks, in combination with specific engine calibration mapping. 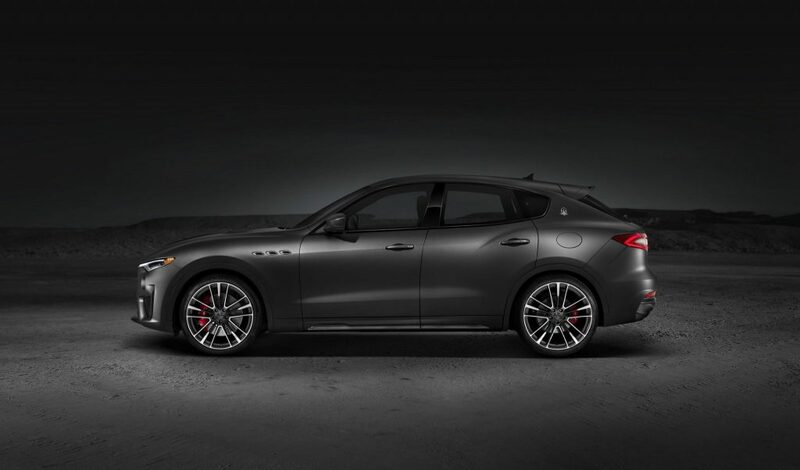 The Levante Trofeo is equipped with one of the most powerful engines ever fitted in an on-road Maserati. This is the 3.8 litre Twin Turbo V8, calibrated to mate perfectly with the Q4 Intelligent All-Wheel Drive system. It delivers a mind-blowing power of 590 hp at 6,250 rpm and a maximum torque of 730 Nm between 2,000 and 5,000 rpm. The engine boasts the highest horsepower/litre ratio (156 hp/litre) of all the Maserati powerplants ever produced and, like all Maserati petrol engines, is assembled by Ferrari in Maranello, Italy. The ideal 50:50 weight balance and the low centre of gravity – common to all Levante models, in combination with the finely tuned double-wishbone front / Multi Link rear suspension, as well as the wider 22-inch rear tyres on forged aluminium wheels, endow the new Trofeo with remarkably balanced handling and lateral stability. 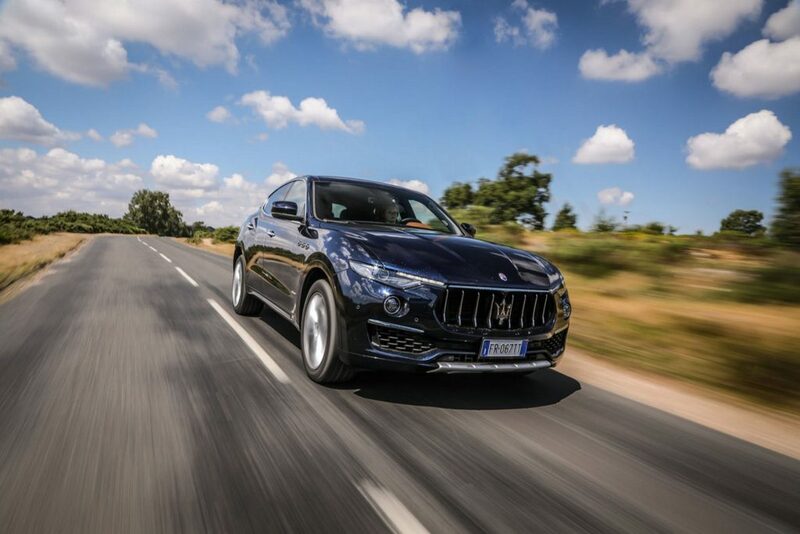 The unmistakable Levante design has reached new levels of sportiness in this top of the line. The side air intakes in the lower fascia give the car’s design a more aggressive look, underlined by two aerodynamic wings that ensure a sense of further stability, visually “pushing” the weight of the car’s nose towards the front wheels. The carbon fibre side bezels and carbon fibre splitter help to improve the airflow distribution. The rear end also looks wider and more muscular, thanks to a sharper carbon fibre horizontal element and body-colour lower extractor that embraces the four oval exhaust tips. 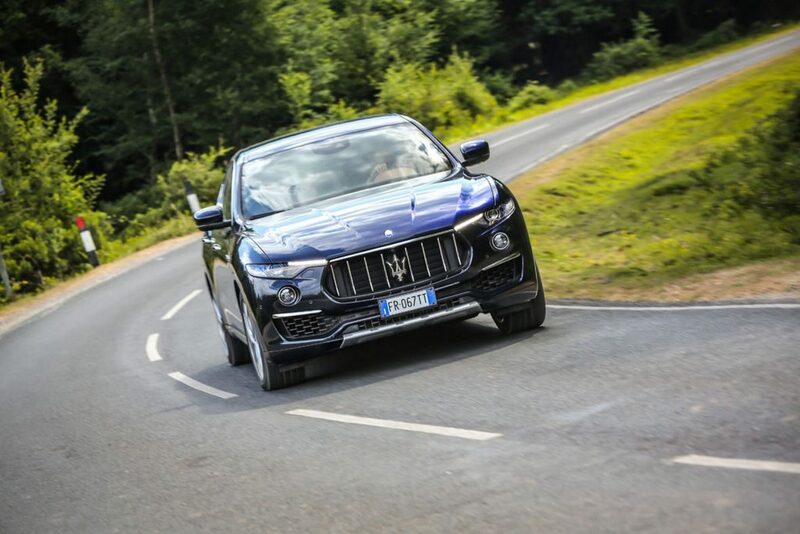 At the front, the Levante Trofeo has Full LED adaptive headlights, a front grille with double vertical bars in Black Piano finish, lower honeycomb mesh fascia, body colour door handles, black oval exhaust tips and high-performance brake calipers available in red, blue, black, silver or yellow. And to cap it off, the specific “Saetta” Trofeo logo adorns the iconic C-pillar of the coupé styled Levante. Specific details of the Levante Trofeo, like the lower splitter, the side blades in the front air intakes, the side skirt inserts and the rear extractor, made of ultralight, high-gloss carbon fibre, further underline this model’s racing look. The hood is new, featuring two aggressive air intakes for better cylinder head cooling. Beneath the hood, the high-gloss carbon fibre sports a V8 inscription and the Trident. The cylinder heads and intake manifolds are painted red. The full LED headlights utilize a digital camera mounted behind the rear-view mirror that supports the Glare-free High Beam detection system, allowing the driver to keep the high beam on without dazzling oncoming drivers. The system is able to create a shade in correspondence of other vehicles switching dynamically on and off the LED matrixes. The full Matrix LED headlights can create up to four light tunnels simultaneously with each tunnel as large as the obstacle. Inside the Levante Trofeo cabin, a wealth of elegant features create an environment of pure luxury. The sculpted sport seats feature a premium full-grain “Pieno Fiore” natural leather available in black, red and tan, all with contrast stitching and “Trofeo” logo embroidered on the headrests. “Pieno Fiore” is like no other leather used in the automotive industry for its natural, soft feel and for the unique character it develops throughout the years. This amazing Levante’s quintessentially sporty personality is highlighted by new details in “3D Touch” carbon fibre, the specific instrument cluster graphics, floor mats with metal Trofeo badges, and a Maserati clock with a unique dial. The on-board outfit is completed by a 1,280-watt, 17-speaker Bowers & Wilkins premium surround sound audio system for a concert hall sound experience. The new “Corsa” driving mode with Launch Control functionality in addition to the existing Normal, I.C.E., Sport and Off Road modes has been adopted to enhance the sporty character of the ultimate Maserati SUV. “Corsa” driving mode further improves engine response and opens exhaust valves in acceleration, as well as providing faster gear shifting, lower air suspension height levels, sportier Skyhook damping and optimized Q4 Intelligent All-Wheel Drive settings. It also interacts with the Traction Control and ESP systems to maximize driving pleasure. The Integrated Vehicle Control (IVC) system has been incorporated for the first time in a Levante, for impressive driving dynamics, better performance and a genuine Maserati driving experience, by helping to prevent vehicle instability, instead of correcting “driver mistakes” as a traditional Electronic Stability Program (ESP) system does. The Brembo braking system deals superbly with the high performance of the Levante Trofeo. The front brakes have adopted 6-piston aluminium monobloc calipers working on 380 mm drilled discs. Aluminium floating calipers with 330 mm x 22 mm ventilated drilled discs are fitted at the rear. The ABS has undergone a specific setup for the Trofeo version. The Levante Trofeo is the first ever Maserati equipped with 22-inch forged aluminium wheels, so Maserati cooperated with Continental to provide the new SportContact™ 6 tyre as standard equipment. The new ultra-sport tyre has substantially contributed to achieving the balanced handling and outstanding cornering performance of the most powerful Maserati in production today. 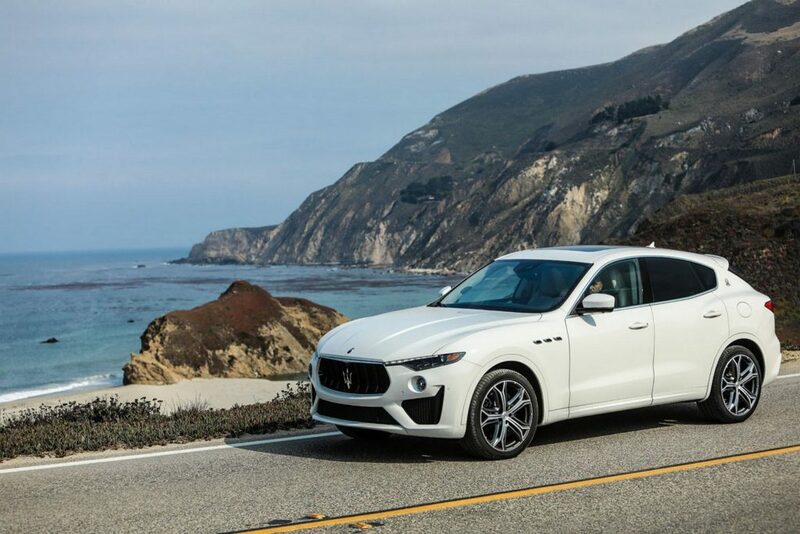 The Levante GTS on display at the Los Angeles Show, in Bianco Alpi colour with sport seats, red “Pieno Fiore” leather interior and 22-inch Orione wheels, is the perfect combination of high performance, sporty verve and elegance. The development of this new V8 Levante GTS is an interesting and special story on its own. 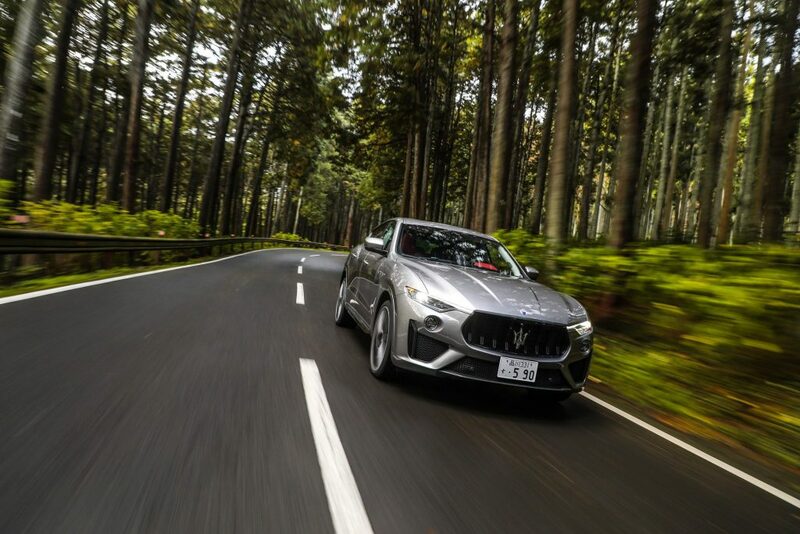 It actually started as a skunkworks project by the Maserati technical centre in Modena, well before the official launch of the SUV model in the spring of 2016. The engineers built a V8 prototype intended to test the performance limits of the Levante platform. The development phase officially commenced in summer 2016, following the World Premiere of the Levante. In association with their counterparts in Ferrari, the technicians and engineers came up with a V8 engine solution that mated flawlessly with the Q4 Intelligent All-Wheel Drive system, immediately reaching the high-performance targets set for the project. They began by focusing on fine tuning of suspension and electronics, and the inclusion of the Integrated Vehicle Control (IVC) in the ESP management. In May 2017, Maserati engineers and testers were assigned around the world to test the first V8 “mule” prototypes with V8 engine on different kinds of road surface and in extreme weather conditions, ranging from the proving grounds of Balocco, Nardò and Barcelona to the twisty, desert or icy roads of Sierra Nevada, South Africa, Arizona and Lapland. The long-term testing activities covered countries and climates at opposite ends of the world, with temperatures ranging from -35°C to well over 40°C. The performance of that ground-breaking prototype inspired the Maserati top management to proceed with the development of not just one but two top of the range versions, both built around the Twin Turbo V8 engine, which became the Levante GTS and the Levante Trofeo. 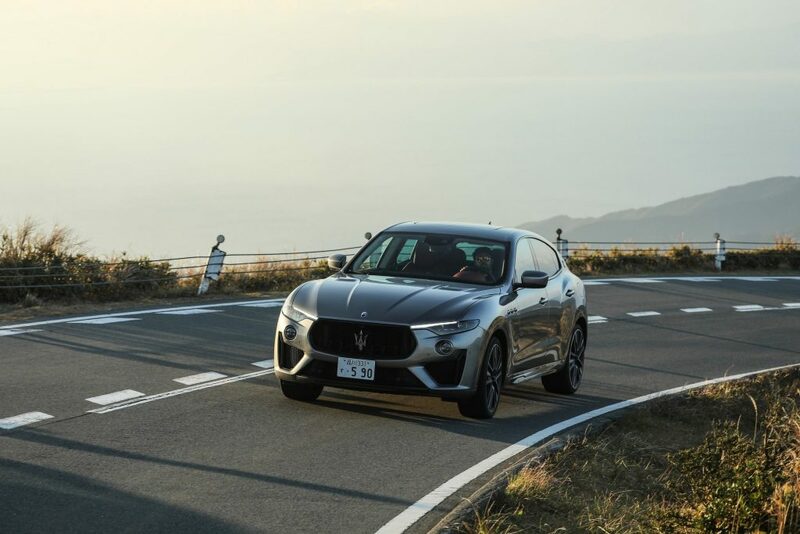 The Levante GTS is powered by the 3.8-litre Twin Turbo V8 engine, a re-engineered, upgraded version of the power unit fitted in the flagship Quattroporte GTS, delivering 550 hp at 6,250 rpm and 730 Nm peak torque at 2,500 – 5,000 rpm. Like any other petrol Maserati engine, this V8 has been developed by Maserati Powertrain in cooperation with Ferrari and is manufactured in its state-of-the art factory of Maranello. Thanks to its remarkable weight/power ratio of 3.9 kg/hp, the Levante GTS needs only 4.2 seconds to reach 100 km/h, while its top speed is 292 km/h. Figures which befit a modern supercar masquerading as a high-end SUV. 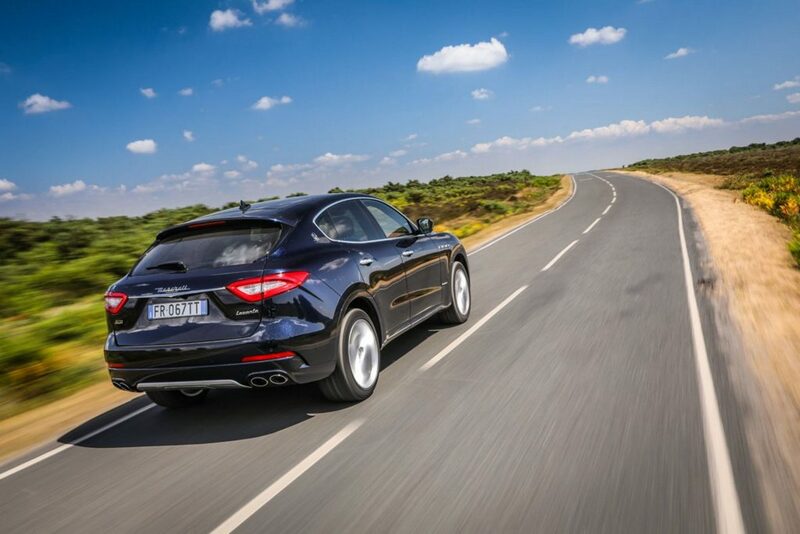 The unmistakable Levante design achieves the utmost in sportiness in the GTS version. Thanks to the distinctive design of the lower front fascia and the rear bumper, the Levante GTS boasts a sportier and yet even more elegant and sophisticated presence. In detail, the Levante GTS features a chromed front grille with black double vertical bars and chromed perimeter, lower honeycomb mesh grille, body colour door handles and rear spoiler and high-performance red brake calipers. The lower front splitter and the rear extractor are also body coloured. Combined with Black Piano inserts in the front and the rear bumper, these details provide the Levante GTS with a strikingly elegant sporty look. The specific V8 version is also distinguished for the GTS badge on the tailgate. The new Levante GTS is available with Full Matrix LED headlights as optional equipment. Compared to the standard Bi-Xenon headlamps, LED technology offers 20% increased visibility, 32% cooler light and double life expectancy. The full Matrix LED headlights utilize a digital camera mounted behind the rear-view mirror that supports the Glare-free High Beam detection system, allowing the driver to keep the high beam on without dazzling oncoming drivers. The system is able to create a shade in correspondence of other vehicles switching dynamically on and off the LED matrixes. The full Matrix LED headlights can create up to four light tunnels simultaneously with each tunnel as large as the obstacle. Interior designers have come up with elegant ways to create a distinctive environment within the Levante GTS cabin providing it with standard Full Premium Leather upholstery, sport seats and pedals, and Harman Kardon Audio system with 14 speakers. The human-machine interface has been further improved, featuring updated display graphics and improved climate system ergonomics. The entirely new gearshift lever features a powerful vertical structure fully wrapped with Premium leather, providing a comfortable grip feeling; it is also ornamented with a metal and black finish Maserati logo. The redesigned instrument cluster graphics resemble a chronograph dial and are inspired by the Maserati racing heritage, underlining the sportiness of the Levante GTS. An array of interior details underlines the sporty character of the Levante GTS: Black Piano trim, aluminium paddle shifters, sport foot pedals, specific instrument cluster graphics and Maserati clock dial, illuminated door sills and chromed trunk sill. Like every Levante, the new GTS boasts a highly responsive interface unit that uses the Maserati Touch Control Plus (MTC+) with 8.4” capacitive touchscreen and a user-friendly rotary knob in the central console, providing intuitive control of the on-board systems. The high-resolution screen operates like a tablet, recognising drag, scroll, swipe and rotate gestures. The system includes digital radio, Bluetooth, satellite navigation supports both Apple CarPlay and Android Auto. MTC+ also controls seat and steering wheel heating, front seat ventilation and the rear window blinds, if fitted. It has been further improved with updated display graphics and improved climate system ergonomics. The button that deactivates the Start&Stop function can now be dragged and dropped on the main screen bar for immediate access from every single menu. The central lower console’s rotary knob is a high-quality forged aluminium component that offers intuitive control of audio volume and other infotainment system functions. The driver can alter the ride height via the nearby rocker switch or by choosing different driving modes on the central console. The height variation from the lowest position to the highest is 75 mm – up to 85 mm with the Park level included. The Levante GTS is fitted with the eight-speed ZF automatic gearbox used on all the Levante versions, a unit acclaimed for its versatility and sporty character. The driver has the option to use the gearbox in either automatic (RND) or manual mode simply by shifting the lever from right to left. The changes to the gearshift lever have led to elimination of the M button on the central console, so the Sport driving mode and the Skyhook electronic suspension damping system sport setting can be selected separately. The new ‘P’ button on the gearshift lever effortlessly selects parking mode. The Q4 Intelligent All-Wheel-Drive has been designed to deliver the “feel” of the traditional Maserati rear-wheel drive and is now updated to suit the requirements of the Levante GTS. In normal driving conditions, the Q4 provides 100% of the engine’s torque to the rear wheels. In low grip conditions and on slippery or uneven surfaces, or if the rear axle loses traction, the system takes just 150 milliseconds to switch to 50-50 torque distribution between the front and rear axles. The GTS, like all Levante trims, is standard equipped with a mechanical Limited-Slip Differential (LSD) at the rear axle that guarantees optimal traction in all driving situations. The asymmetric locking feature offers 25 per cent lock-up under power and 35 per cent under release. In conjunction with the Q4 Intelligent All-Wheel Drive system and the LSD, the torque-vectoring function considerably enhances the car’s sporty character: when cornering, the system distributes more torque to the outer wheels by applying a slight braking force to the inner wheels. The pneumatic suspension essentially shares the same components and geometry as the other Levante trims. Suspension frame, wishbones, hub strut, towers and the crossbeam reinforcement are all made of light aluminium alloy, using a moulding technology that ensures greater rigidity without weight increase. The Air Spring control has been tuned to fit the specific characteristics of the new Levante GTS and is appropriately optimized for each driving mode. The pneumatic system provides six different levels and 75 mm height variation from lowest to highest position. With the same engineering approach, the Skyhook Sport electronic suspension damping system has also been recalibrated to meet the handling needs of this new V8 engine model. The Integrated Vehicle Control (IVC) system has been incorporated to offer even better driving dynamics and road holding, as well as the thrilling driving experience expected of a real Maserati. Alongside the Levante Trofeo, the new Levante GTS brings the GranTurismo philosophy in the SUV segment in its purest form. In the Levante GTS, the Maserati IVC system has been incorporated in the ESP control. IVC uses a smart, feed-forward controller that predicts driving situations and adapts the engine speed and braking system capacity accordingly, providing superlative driving dynamics, better performance and more effective active safety. The system helps drivers maintain control of their vehicle, instead of simply correcting “mistakes” as traditional Electronic Stability Program (ESP) systems do. In its Levante GTS application, IVC is specifically tuned to decrease understeer tendencies, typical to SUV cars. An understeer/oversteer function inside the Electric Power Steering (EPS) control cooperates with the IVC system, resulting in a more natural and predictable driving feeling. The system instantly controls the steering torque on the steering wheel providing the driver with optimum feedback, especially in sporty driving. The braking system deals superbly with the remarkable performance of the Levante GTS. The front brakes have adopted 6-piston aluminium Brembo monobloc calipers working on 380 mm drilled discs. Aluminium floating calipers with 330 mm x 22 mm ventilated drilled discs are fitted at the rear. The ABS has undergone a specific setup for this GTS version.